The UT3 Series HMIs have it all! Every feature of all EZTouch models plus more are combined into the next generation UT3 Series with even greater prices. Our line of HMIs have been consistently voted to have the easiest HMI programming software available, with the same programming software for every model and size. You can seamlessly transfer your existing EZTouch project to the UT3, which also offers exclusive on-line program editing with no downtime. An OEM Packager allows you to send updates to customers without the need for additional programming software. The UT3 comes with a faster processor, faster programming capabilities with USB and built-in Ethernet, increased image processing speed, highly reactive Touch Screen response, plus fast and reliable PLC communications. Including Allen Bradley, Mitsubishi, Modicon, Omron, Siemens, Direct Logic (Koyo), GE, and of course EZPLCs. Features full 65,536 color spectrum HMI Touchscreen, a brighter operator interface display, and higher resolution. Data Highway + Remote I/O supported on option card, 2 Serial Ports (RS232/422/485), 2 USB Ports (Type A for data logging and Type B for programming, and a MicroSD card slot for data logging. 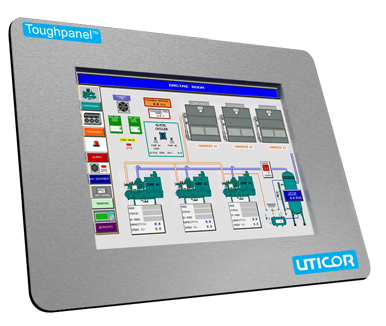 This App currently works with Uticor’s UT3 Series, Windows-based CE Toughpanel HMIs, Windows 7 based Tough Windows HMI, EZTouch Plus the Dedicated Tough Touch Plus, or using our runtime SoftHMI software running on a compatible PC. Support for other platforms is under development, and updates will be announced when available.